Mud fights? bug collecting? Over the last 10 weeks we have explored lots of different things to do with our kids in the summer and before we end our “15 things to do with your kids in the summer” series, I just wanted to share that I have had a lot of fun pulling together a bunch of different ideas activities to do with your kids. I hope that they have inspired you to “think outside the box” and come up with some fun ideas to do. That the weekend is finally here let’s make these two short days count. Let’s laugh and play and plan a bunch of fun things to doing with the kids. How are you making the most of these last care free days of Summer vacation? This time next week the kids are back to school and our summer break will be nothing more than a sweet distant memory. Back to homework, piano lessons and early mornings. It will all be here too soon and we will have to adjust seamlessly to what is a different life than the one we have lived these past few summer months. Instead of thinking about school and preparing too much for it, I am more concerned with how we are going to spend the last week of summer break and ways we can fill our time to create long-lasting memories. 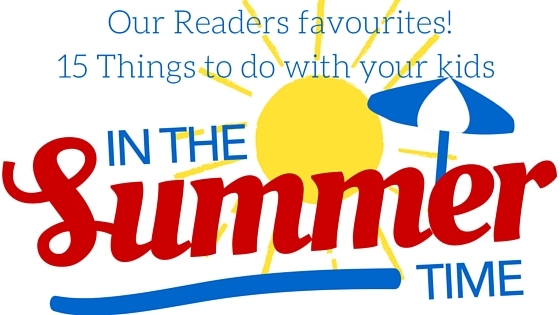 Take a peak at our readers favourite things to do with your kids in the summer. What was your favourite thing to do with your kids? Before we know it, we will be talking about the things to do during Christmas break! Time flies, so cherish this week and realize that a lot can change from this summer to the next so be grateful for everything and everyone around you. Thank you for joining us over these last 10 weeks. I hope you have found some great new thing to do with your kids this summer. Are you looking for more things to do with your kids? I need to get to the library. That used to be my favorite summer activity. Loved this series! We did a lot on your list this summer. Thanks so much for all the great reminders of how to have fun the simple way! Camp FIRES and catching fire flies!! I’m sad summer almost over but this is such a great list for year after year! We did most of these things except decorate an apron. Since I’m always in the kitchen, I may try to squeeze this one in! What a great list! We did most of these on your list but the best thing I did this summer with my kids was every Sunday morning we went canoeing and kayaking on a local lake. The wildlife was just stunning and it was great exercise too! This was a nice list of things to do. What I liked most about your list is the fact that many of the summer activities would be good for fall also. I hope you do this series for Christmas break too! I know you will help us with ideas! Christmas break is quite short (not sure how long my American friends have) and we are already cooking up an amazing surprise for the kids. Can not wait to tell them!! We have an excellent homemade non-tomato sauce that we use with our pizza and it’s amazing! Oh paper boats! I forgot about that. That would be so fun to do. I love all the lists of fun things. Great adventures. School starts on Wednesday and I feel like sobbing! We did the library today actually. I love that suggestion. There’s a nice breeze out so a nice kite flying would be great. What a great list! We start school next week, so we have some precious summer time left and these ideas are perfect for spending those last free days! I really like the idea of blowing bubbles and also star gazing! So many great ideas. One thing we didn’t do was star gaze…. That is something my kiddos would love and I’m wishing we did this summer. We also didn’t blow many bubbles… whoops! Me too… but I’m looking forward to some of the exciting things that Fall has to offer. Wow, you’re right, Christmas will be coming soon. I can hardly stand how fast things are moving. It is really nice to go back and think about all the fun things we do with our children! It creates happy memories to last forever! You had me at books and library for this one. I am a nerd yes. Summer goes by so fast – school starts tomorrow. Where did the summer go? Great list of fun summer things to do. My oldest starts back today but the middle two don’t start back on the 8th and the littlest starts on the 11th. Summer goes by so fast it feels like we didn’t really have a summer and now it’s almost gone! I have no idea how parents keep kids occupied… needless to say I’m looking forward to term time starting! Some days are more entertaining then others… a lot of the time they just want to play outside with their friends and ride their bikes up and down the green belt for hours. These are all great ideas to do with the kids in the summer time. I never did think of floating the paper boats in the lake with my boys. My nephews would totally love this idea so we will have to do that this week. Thanks for sharing. What a great list! I definitely some of these with the kids this summer! Really great to do and close to home! 🙂 Thanks for sharing. My kids are at their grandparents house almost everyday because we live just a quarter of a mile from them. I think of all the 15 activities, I would want to go fly a kite with my children. Its been a while since we did that. Camp fire and home-made pizza! These are all awesome things to do in the summer..
All of these are great ideas! I almost think that I missed the summer this year, since I spent most of it indoors with a baby. Oh well, there is always a next one, right? Great list! We will be doing a campfire in a few months when we go camping at Disney! I need to take my kids to the park and fly a kite, I bet they would like this! Love that visiting the library and reading 10 books are both on the list. Those used to be some of my favorite summer activities when my kids were little. One thing we haven’t done this summer that I wish we had is visit the library! There’s still time left before summer is officially over so we’ll have to take trip there. Thanks for the great list!